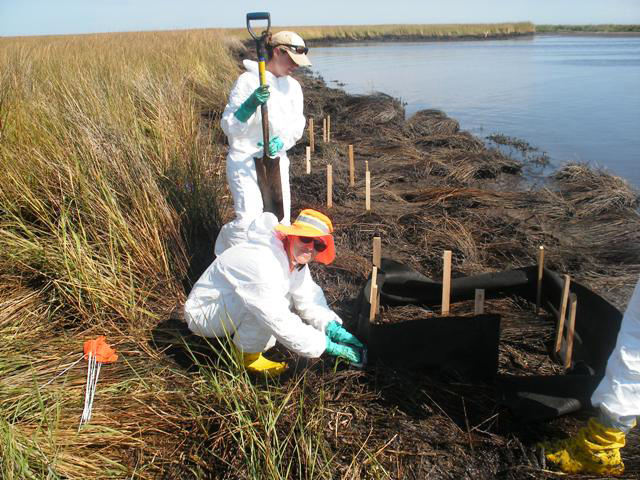 Scientists from the University of Florida surveyed the vegetation at oiled and non-oiled Louisiana marsh sites to assess impacts from the Deepwater Horizon oil spill. They found that shoreline vegetation confined the oil to within 15 meters from seaward edges of marsh, and that within this area, there was a mix of healthy and severely degraded oil-covered sites. Damaged vegetation in non-eroding areas nearly fully recovered after about 1.5 years. However, in areas already eroding, the oiled marsh grasses died, exposing its substrate and increasing the erosion rate that led to permanent loss. After about 18 months, the retreat rates returned to reference levels. Researchers published their findings in the July 2012 edition of Proceedings of the National Academy of Sciences (PNAS): Degradation and resilience in Louisiana salt marshes after the BP–Deepwater Horizon oil spill. From October 2010 to January 2012, the team conducted time-series studies and field experiments in Barataria Bay – an area that experienced some of the heaviest oiling. The team found that inland marshes were largely untouched by oil because the height of shore-line vegetation, which rose to the level of the high tide line, “blocked and confined” the incoming oil. However, this oil containment caused “extensive mortality of marsh plants” and “sub-lethal impacts on plants 10–20 meters from the shoreline.” The damaged sites had “oil-covered dead and horizontally-laying decaying grass stems” with surface sediment having polyaromatic hydrocarbons (PAHs) levels “greater than 100 times higher” than in the non-oiled sites. Also, there were dead mussels, snails, and below-ground plant material. The marsh die-off led to subsequent “erosion on the steep edges of these already receding marsh platforms” and the erosion rate was “more than twice as high at oil-impacted sites.” This erosion led to permanent loss because the land was no longer present to support recovery. The “oil generated death of [the] stabilizing root matrix at the edges of these marshes triggered a geomorphic response” that led to “the degradation of the elevated platform on which marsh vegetation depends.” The team found that the die-off was most likely not caused by the oil’s toxicity but, rather, the heavy coating of oil on the plants that interfered with photosynthesis. 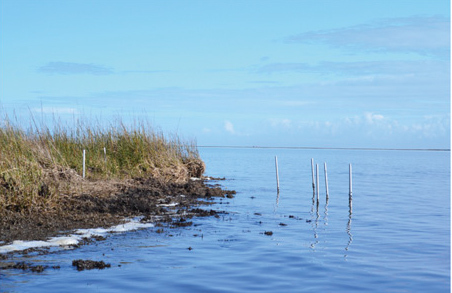 The study provides both optimism – resilience and recovery of vegetation and its protection of inland areas – and concern – die-off and loss of marsh along eroding shorelines. The broader findings show that multiple stressors, including oil spills, induce environmental responses that hasten ecosystem decline in the already-vulnerable Louisiana marshes, limiting recovery of otherwise resilient vegetation and increasing permanent habitat loss and the loss of its services. The habitat loss from erosion will likely affect long-term oil spill impacts. This study’s authors are Brian R. Silliman, Johan van de Koppel, Michael W. McCoy, Jessica Diller, Gabriel N. Kasozi, Kamala Earl, Peter N. Adams, and Andrew R. Zimmerman (PNAS, 2012 109 (28) 11234-11239). Andrew Zimmerman noted that their group and another researcher published recent findings on microbial oil degradation in marsh sediment within a year of the spill. (Environmental Science & Technology, 2013 Dec, doi: 10.1021/es4036072). This research was made possible in part by a Grant from BP/The Gulf of Mexico Research Initiative (GoMRI) to the Florida Institute of Oceanography. Other funding sources included the National Science Foundation Biological Oceanography Program.